Maame Yaa Jackson who is a well known young actress of Kumawood has teamed up with Drake J another talented artist from Ghana. Drake J is also known as young millionaire for his possession of gold and other valuables. Drake J is currently in the studio recording a lot of hot songs featuring a list of artistes such as Kooko , Nero X , Kwesi Arthur ,Kofi Mole and several others. 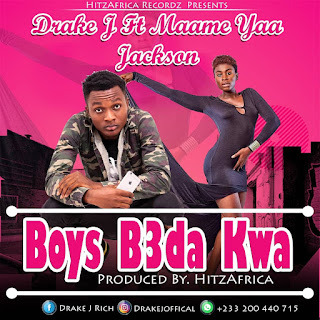 Drake J has recently featured Maame Yaa Jackson on the single titled " Boys B3da Kwa" . The song is set to be released on 27 November 2018 . Production credit goes to HitzAfrica Studio. Visit thus same site on 27 November to download the awaiting tune.